WASHINGTON — A trove of documents housed in a secure vault at the John F. Kennedy Library has long been described as Robert F. Kennedy’s private papers and been kept from public view by the Kennedy family. But many of the documents have little to do with personal matters and instead detail once-secret military and intelligence activities he helped manage as attorney general, according to an unpublished index of the collection obtained by The Boston Globe. Scholars and government officials believe the 62 boxes of files covering Kennedy’s three years as attorney general during his brother’s administration could provide insights into critical Cold War decisions on issues ranging from the Cuban missile crisis to Vietnam. Yet the Kennedy family, led by Robert’s widow, Ethel, has rarely permitted even limited access to the papers. Their expansive control of the RFK archive, which extends to dozens of Pentagon, State Department, and CIA documents, stems from a controversial agreement reached with the National Archives following Robert Kennedy’s assassination in 1968. Numerous government archivists and historians maintain the family should never have been granted oversight of the official documents — only the files containing private information, such as correspondence with Jacqueline Kennedy Onassis and a collection of materials involving famous family acquaintances like Frank Sinatra. Put another way, “Ethel has been given control of documents that she couldn’t even legally read because she didn’t have a security clearance,” said a former National Archives official who had the authority to handle top secret information regarding the RFK papers. The Globe first reported in January 2011 that most scholars have been unable to get access to the documents. But the index reveals for the first time an overview of the contents of the collection and the fact that most of the documents are not personal papers. 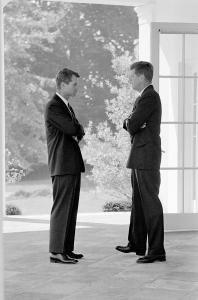 Representatives of the Kennedy family declined requests to discuss the issue in detail. Matthew Maxwell Taylor Kennedy, who has handled the issue on behalf of his mother, said in an e-mail that the family was deferring questions to Joseph E. Hakim, a business executive who formerly oversaw some of the family’s financial holdings. “I know he is working hard with the National Archives to figure out a way to release all of the papers,” Max Kennedy said. Hakim did not respond to several telephone messages and e-mails. According to a person who has been closely consulted by the family on the issue, the government’s mishandling of the papers began when Kennedy’s office was packed up in the summer of 1968 and the contents sent to the National Archives for storage. “RFK had access to classified documents and who knows what he had in his offices when he died,” said the person, who spoke to the Globe on the condition of anonymity, for fear of upsetting the family. Several years later the National Archives and RFK’s heirs reached what Thomas J. Putnam, the director of the John F. Kennedy Library and Museum in Columbia Point, described as a “deposit” agreement. In the legal memorandum, he said, the family agreed to keep the papers in the JFK Library but was given the right to review any access to them. The family also agreed that it would sign a deed granting the National Archives full control of most, if not all, of the documents. But there was no deadline set for the deed, and despite the library’s efforts, negotiations to secure one have started and stalled repeatedly over the decades. The Kennedy family has said it granted access to the papers to a few historians, but library officials maintain no one has seen them all — out of concern for the family’s privacy or because so many files were stamped secret. Even the author hand-picked by Ethel Kennedy to write a comprehensive biography of her husband — former Kennedy White House aide Arthur M. Schlesinger — was granted limited access, according to private correspondence recently reviewed by the Globe. “I told her that there would be no direct quotes from the papers without her permission,” Burke Marshall, who ran the Civil Rights Division at RFK’s Justice Department, wrote to Schlesinger on Mrs. Kennedy’s behalf in February 1969. In his private notes, Schlesinger himself expressed frustration in 1985 that the files were not fully released. Papers from other chapters of Robert Kennedy’s public life — including when he served as his brother’s campaign manager; his efforts in the Justice Department to combat organized crime; and his three years as US senator from New York — have been released by the library with the family’s consent. The withheld files are broken into two categories, according to the nearly 40-page index, whose authenticity the Globe verified with a former library official who worked directly with the collection. About half make up the attorney general’s so-called “classified” file and the rest are labeled the attorney general’s “confidential” file. Both series of files document Kennedy’s broad portfolio as the president’s most trusted adviser, including in foreign policy. That was a distinct departure from previous attorneys general, who were responsible almost solely for domestic law enforcement. For example, the confidential files included the “top secret” minutes from the Cuba Study Group in 1961, when the US government was trying to assassinate Fidel Castro — an effort in which Robert Kennedy was deeply enmeshed. Also of particular interest to historians, as the 50th anniversary of the Cuban missile crisis approaches this fall, are his top secret “notes and memos” from the Executive Committee he chaired for the president during the 1962 crisis. Other files labeled top secret are titled Operation MONGOOSE — the secret CIA plan to kill Castro — including RFK’s notes from a meeting about the operation held in the midst of the missile crisis. Many, if not all, of those documents can now be declassified and released to the public, historians and government archivists maintain. Putnam agreed and said most of the documents have recently been declassified. The next step is to consult the family and gain approval for their release, he said. According to officials and family advisers, RFK’s heirs have dragged their feet in granting permission in part because the government records are interspersed with items deeply personal in nature. While not classified, many of those files are labeled as requiring “careful screening,” according to the index, written by a National Archives official in 1975. They include RFK’s letters to and from his wife; sister-in-law Kennedy Onassis; his father, Ambassador Joseph P. Kennedy; as well as his sisters and eleven children. Two other files cover his brother, former Massachusetts Senator Edward M. Kennedy, while a “thick folder” contains communications between RFK and JFK — though it is unclear whether those cover official or personal topics, or both. Further underscoring the complicated task of separating government documents from personal files are a series of boxes that appeared to contain a combination of the two. For example, several sequential boxes labeled “personnel reports” contained a sensitive file on Sinatra and another, labeled top secret, about journalist Joseph Alsop. Mixed in with a file of “sensational” news clippings about Marilyn Monroe were “secret” items from FBI Director J. Edgar Hoover and the CIA. Meanwhile, filed away with a secret folder on Robert Komer, who ran the Civil Operations and Revolutionary Development Support program in South Vietnam — the effort to win the “hearts and minds” of villagers during the Vietnam War — were “two thick folders” from Kennedy White House press secretary Pierre Salinger “on the Blauvelt ‘genealogy’ matter,” referring to unsubstantiated claims that President Kennedy was married to another woman before Jacqueline. At least one person who has a file labeled for careful screening in the collection said the custody issue should be resolved and all public documents released. “It’s been nearly 50 years. I can’t think of a single reason why they can’t be made public,” said Mortimer M. Caplin, who served as head of the IRS in the Kennedy administration and was one of RFK’s law professors. Library officials have expressed frustration that the process has taken so many years. But another sticking point, according to e-mails obtained by the Globe, has been the family’s desire to have all of RFK’s papers appraised for their monetary value so that when they deed them to the National Archives they can receive a tax deduction. John Reznikoff, an appraiser who runs University Archives in Westport, Conn., was consulted by the Kennedy family several years ago on how to properly assess the collection’s worth. But Reznikoff, who previously appraised some of Richard Nixon’s private papers, said that, to his knowledge, the Kennedy appraisal effort has stalled. In an internal e-mail in 2007 about organizing an appraisal of the archive, Putnam expressed confidence that 2007 might be “the magic year” for the RFK papers to be shaken loose.